The past couple of weeks have just been terrible for me as far as my health has been concerned. In between having two asthma attacks, a nasty bout of Hey fever and a viral chest infection (yuck), I’ve had no time to keep on top of my blogging, never mind anything else! Thankfully I’m doing a lot better now and I’m actually looking forward to the warm weather – something I’ve always dreaded before. Summer for me has always meant chunky cardigans, long, shapeless maxi-dresses and boots, however lately I’ve found that my confidence is beginning to increase little my little and it’s beginning to reflect within my outfit choices. I’m a sucker for clashing prints at the moment so when I saw this cute playsuit in Primark a couple of weeks ago, I snapped it right up. I’ve never been one for jumpsuits as I found in the past that the material would gather in the middle, making me look about 8 months pregnant, however I find Primark’s playsuits to be pretty roomy so I sized up just enough for there to be that little ‘sag’ in the middle. 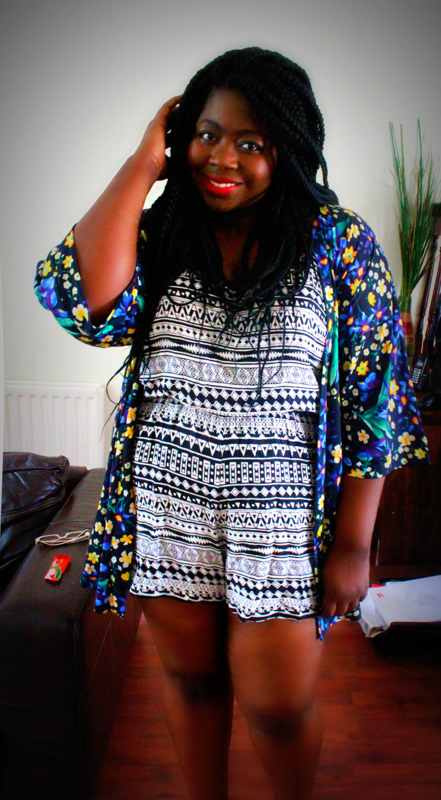 I paired the ‘suit with my floral kimono from ASOS Curve – I also sized up with this as I wanted that drape-y look. All in all, I think this is a nice outfit for an evening date (paired with a floral crown perhaps?) or even for a day out at Wireless Festival – very Summery! Previous Post Festival Lovin' with Simply Be.